Global trends towards urbanization are confronting cities and governments with new sets of challenges related to public safety and security, the supply and consumption of energy, waste treatment, and traffic management. In 2013 alone, the cost of congestion in the US – defined as fuel plus opportunity costs (time) – totaled 124bn USD. In metropolitan areas, smart mobility turns out to be one of the most difficult topics and, at the same time, one with the most impactful prospects to face. Integrated Mobility Platforms (IMPs) are a key solution to urban traffic management. By integrating different modes of transport, IMPs drastically simplify route planning and make traveling more efficient, while being able to provide highly customer-tailored solutions. As a result, IMPs are being established all over the world, with different kinds of integration levels and value propositions (i.e., Citymapper, GoEuro, Google Maps, Moovel, Moovit, Qixxit, Rome2Rio). Yet, none of these players has yet emerged as a prevailing provider with a superior offering. Consequently, we must ask what the key success factors of integrated mobility are, and what the future of integrated mobility will look like. 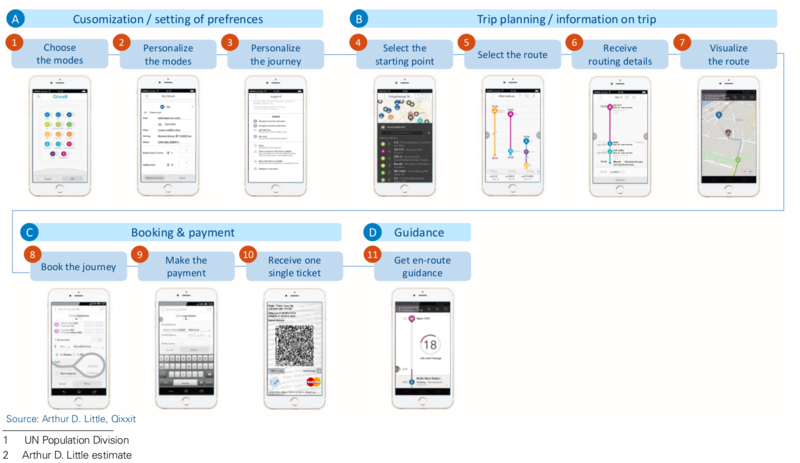 With an increasing number of players involved, and an enlarging as well as more integrated product portfolio, direct access to the customer moves from transportmode operators into the digital space. This risk needs to be understood and eventually handled by all players looking to enter the smart-mobility ecosystem. Are you ready? In 2050, 67 percent of people will be living in urban areas, in contrast to 52 percent in 20101 . Because of urbanization, cities and governments are increasingly confronted with new sets of challenges related to public safety and security, the supply and consumption of energy, waste treatment, and traffic management. The smart-city concept is perceived as a winning strategy to cope with the emergence of these urban problems, and estimated to grow to a more than 45bn USD market by 2022 in Germany alone2 . At the core, a smart city is the aggregation of all major urban policies, such as digital city, green city, and knowledge city, in a unified digital space, aiming to reduce the environmental footprint and create a better quality of life for citizens. In this context, smart mobility is one of the most difficult topics to face in metropolitan areas, but at the same time, the one with the highest impact. 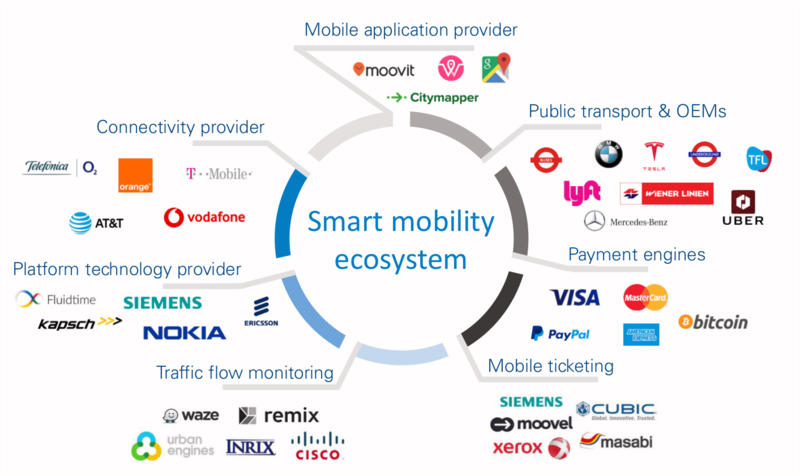 In this report, we focus on an essential centerpiece of smart mobility: the Integrated Mobility Platform. The cost of congestion – defined as the time and fuel wasted plus opportunity costs (increased indirect cost of doing business) – in the US totalled 124bn USD in 2013. As one solution, smart mobility is poised to ease urban traffic flow, involving both economic and environmental aspects. It is traditionally enabled by ICT infrastructure catering to backend and front-end applications. Whereas the former aims at optimizing traffic fluxes from an infrastructure-planning point of view, the latter is supposed to bring smart mobility to the end consumer. The development of smart mobility front-end solutions is mainly driven by shifts in traffic-usage patterns, combined with the rise of digital solutions and the increasing number of transport players available to customers around the globe. In the age of digitization, consumers become more and more used to receiving customized product and service offerings, which allows for the highest level of convenience. In mobility, and even more so in public transport, this means that users care less about single transport modes or operators, and are, rather, interested in simple, integrated and highly customized, end-toend solutions incorporating their individual travel preferences, such as speed, price, convenience and environmental impact. Smart-mobility ecosystem players, depending on their nature and competitive positioning, have a strategic incentive either to join existing platforms or to establish their own. Whereas private companies are aiming to increase their user bases to grow revenues, public companies generally have stronger interest in promoting mass transit. Similarly, automotive OEMs are seeking to capture a large share of the car-sharing market and push their own vehicles into municipal transportation systems. For large tech companies, such as Google, which seek to expand their map services, the data collection aspect of an IMP is of the most value. As a result of this divergence in objectives, two main strategies of Integrated Mobility Platform providers can currently be observed in the market. On the one hand, infrastructure-heavy “back-bone” platform providers, which traditionally originate from well-established public-transport operators, aim at long-term traffic improvements while, at the same time, offering more convenience for customers. On the other hand, over-the-top (OTT) players often operate under the maxim of short-term user maximization to drive enterprise value. Yet, both strategic approaches rely on key factors to demine the future success of an IMP.